What occurs when you play the role of teacher, facilitator, brand advocate and architect all at the same time? 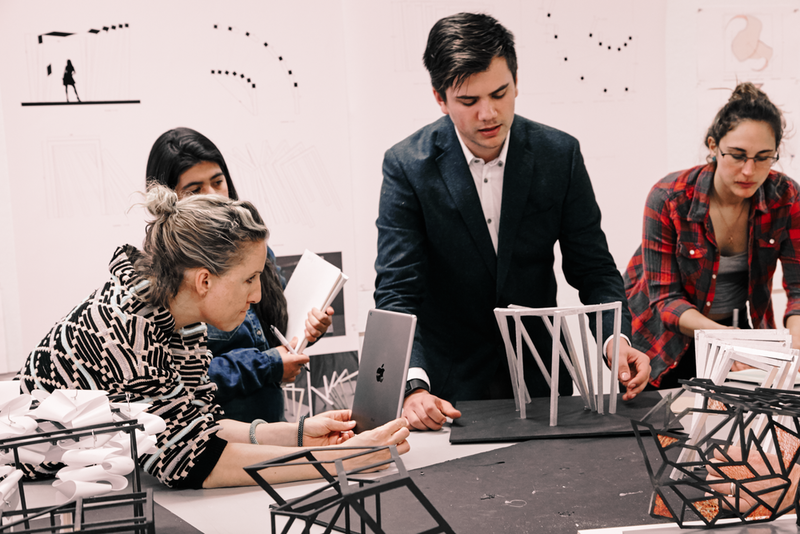 Lara Hoad and Todd Erlandson reprise their roles as joint studio instructors at Woodbury University’s School of interior Architecture, bringing a professional client project for their second year students. The studio, “Branding & Identity: The Retail Environment,” investigates how interior architecture can inform branded retail experience. The client, fashion brand Tadashi Shoji, is expanding its signature flagship stores into shorter lease concept stores, working with the students to develop branded installations for the first iteration at the Glendale Galleria. “The students had an expectation that they were going to work with a brand, but not one with the creative caliber of Tadashi Shoji,” says Hoad. Tadashi Shoji has worked with March Studio since the design of his personal residence in Pasadena in 2002. The long-term relationship with the client has established a trust in March Studio as stewards for Tadashi Shoji’s evolving brand. The studio is an introduction to March Studio’s process of bridging the gap between the branding strategy and the interior architecture. “We like to think of a brand as a gut feeling,” says Erlandson. The students began to research the brand from the customer perspective. They visited his store, warehouse, and studio in Los Angeles, observing and listening for the vision and core values of Tadashi Shoji. Their first assignment was to create an object that embodies the Tadashi brand, a brand “talisman.” The talisman expresses the essence of the brand from the student’s perspective as a designer, translating it into a physical object. This assignment gave Tadashi an opportunity to hear how people perceive the Tadashi brand. The discussion with the client allowed the students to refine their readings of the brand. 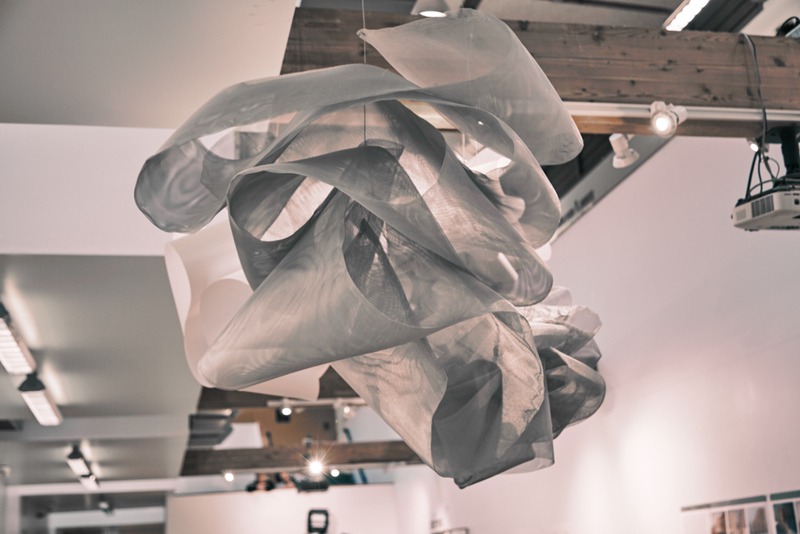 “Tadashi responded well to the talisman object, he liked seeing how the students interpreted his brand,” says Hoad. 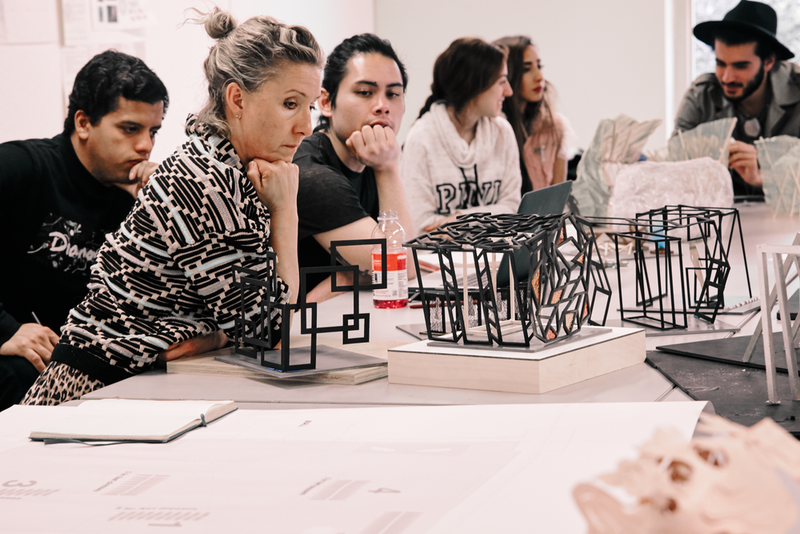 Working under the challenge set out by the syllabus, “How is the brand experienced through architectural elements from the micro to the macro,” students worked in teams of three and translated their talisman objects into branded installations. These installations were designed with recycled and off-the-shelf materials to act as backdrops juxtaposed and contrasting with the fine detailing of the dresses. 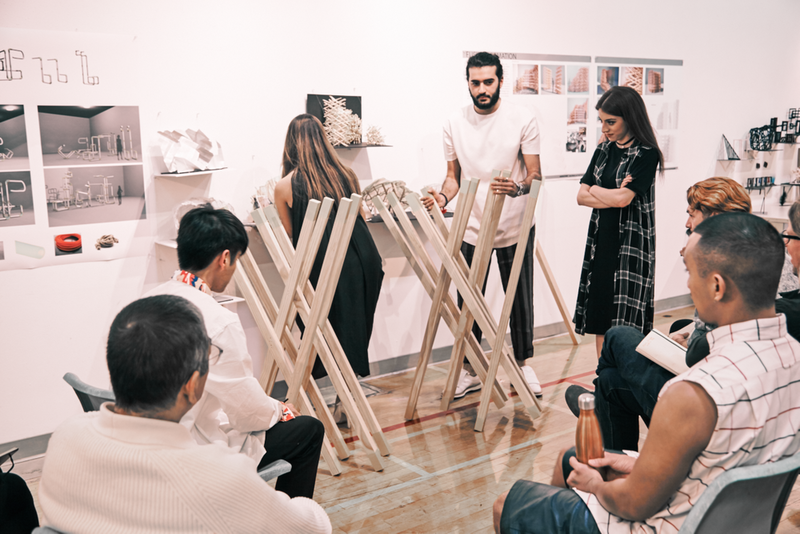 During this stage, the students met regularly with the contractor from and representatives from Tadashi Shoji to help the students develop their installations with an eye towards fabrication and brand authenticity. “It is a privilege to have an artistic and creative client, who is observing the world around him, send you inspiration throughout the project,” says Hoad. The constant two-way information stream continued throughout the semester and the project development. Todd and Lara would send progress to Tadashi and receive feedback, which they would filter for the students. It was a unique balancing role for this project, having a responsibility to both the clients and the students. “Our role was the moderators in the middle. We are working for the client on the project, while having a process we want to walk the students through as educators,” says Erlandson. The final assignment was to create a brand extension with its own retail experience for Tadashi Shoji. The students used the insights they gained from the previous assignments to develop their brand extensions. “The evaluation is constantly bringing their ideas back to their understanding of the Tadashi brand. They have to dig into the client and find what aspect they connect with to build upon,” says Erlandson. The students created “brand bibles” which illustrated their understanding and development of the Tadashi Shoji Brand. 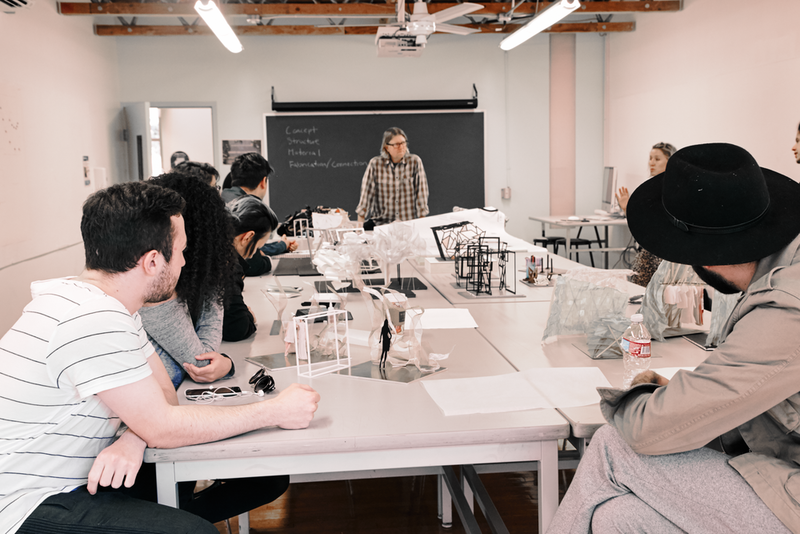 This four-way conversation between the students, Tadashi Shoji, March Studio, and the contractor, was an experimental process in designing a retail experience that benefited all teams. The students benefited greatly from the personal attention of project stakeholders for a professional project. They gained an understanding of branding and developing full experiences around a brand. Tadashi Shoji found something positive and supportive from each of the students’ projects. As a designer releasing collections four times a year, he is constantly looking for inspiration and the students inspired him. For us at March Studio, it reinvigorated our desire to work with a physical brand talisman in our practice. While it was challenging at times to be at the crux between an academic and professional project, this intersection of two passions in one project reminds us of the balance we try to strike in all our work between the brand and the architecture. We look forward to undertaking more complex projects like this is the future. Stay tuned.